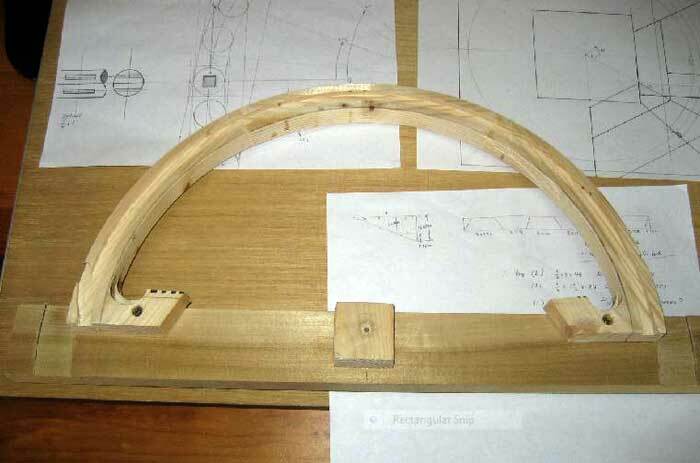 Why build your own wooden steering wheel? Some might want to call me cheap, but I just can't bring myself to buy a Nardi or Moto-Lita (or Tourist Trophy, VB wheel, etc) when it's going to run at least several hundred for the wheel and another hundred or more for the hub. You can literally spend thousands on a particularly nice Nardi. Why spend all of that money just to buy a generic, aftermarket wheel for a car that's not terribly valuable from the start!? It makes no sense to me! I set out to make my own wood wheel which will utilize a genuine OEM wheel frame and thus allow me to use the standard hub, horn connection, etc. Not including my labor, I set out to complete the task for under $100. Also, my goal is to write-up the entire experience. I believe others have made their own wood wheels, but nobody seems to have taken the time to document the steps including plenty of pictures for the uninitiated such as myself. One last note before we begin: I do not consider myself a "wood worker." I've watched years and years of New Yankee Workshop and This Old House, but that's about the extent of my expertise. However, I do tend to take my time when doing something new and when I am unsure about something I'll research as necessary to get the right answer. 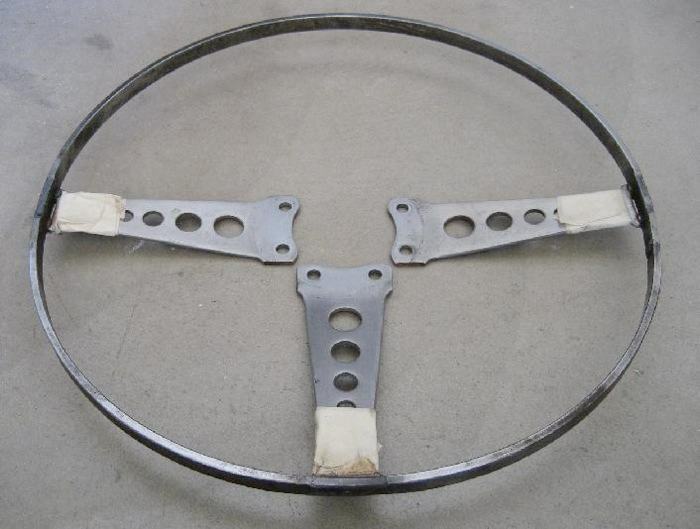 While these instructions are for making your own MGB steering wheel, the same principles apply to the creation of a wooden steering wheel for any classic car, assuming you can find a suitably inexpensive metal frame to attach it to. When finished, I wanted things to look as original as possible, so I decided to use a stock MGB 1972 wheel for my project. To get started I stripped the foam from the wheel and had a look at the frame. Hmm, what can I say about the construction of the steel frame? To be polite, it's less than beautiful and far from elegant. To be blunt and forthright, it should be a lesson to any new student of metal fabrication and welding in how not to construct a steering wheel subassembly. The rim is not a very precise circle and the welds are far from neat. I suppose there was no need for beauty in construction as the rim and welds were covered by foam moulded into place around the rim. I'll resist further scathing review by only saying the fake, moulded stitching is for lack of a better description, pathetic. The stitching certainly is not functional and it's not fooling anyone so why bother? Perhaps I should say now that some designers and engineers believe every detail whether seen or unseen should be well executed and elegant; I am one of these types of people. Hearing this may help the reader to better understand the rationale of some of my later comments and design details. 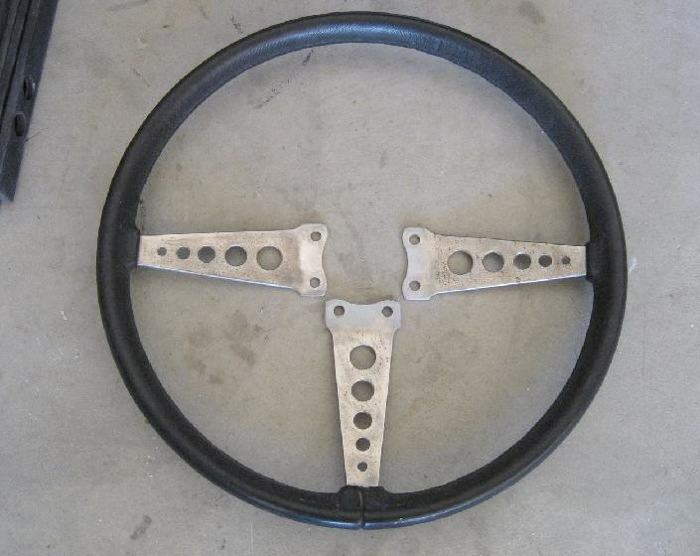 See the following two pics: Figure 1 shows a stock steering wheel removed from the hub; the foam is still intact. Figure 2 shows the wheel with foam removed; the tape was applied to avoid scratching the spokes when using a wire wheel to clean the outer rim. Anyone who has thought about making a wood wheel has likely determined there are two schools of design: 1) a bent wood rim and 2) a segmented wood rim. I do not have a steamer so the bent wood design was not gaining any traction with me. Also, the bent wood design will limit your choices for wood as certain species bend satisfactorily while others will cause you great pain in your efforts. I have seen numerous examples of segmented wheels and I think they look just fine, and I also knew that I could fabricate such a wheel without having to make or buy any additional tools. So, without any further internal debate or outlay of cash, the segmented wheel design was my choice. Next, how many segments would I use? Once again, my laziness and frugality helped me to decide. I drew up a few example layouts using four, six, or eight segments. After some review of each design I chose the six segment layout since to my sensibility it was the best use of material, it didn't have too many joints, and it meant that I could have reasonably straight grain in each segment. Perhaps I should also mention that I had some scrap pine stock to use for a prototype and the width of the material also meant that six segments was the most logical choice. Following are two pages of rough design work when I was figuring out how to proceed. 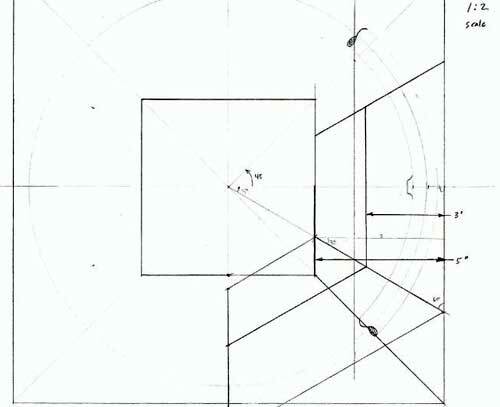 The first shows layout for a six segment or four segment wheel. The second shows the cross section including major diameters and the associated calculations. Figure 3 shows the layout for a four or six segment design. 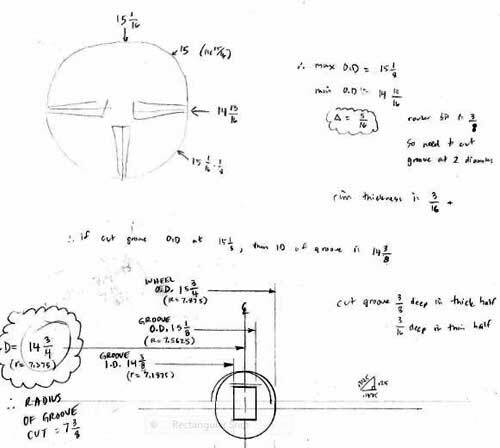 Figure 4 shows some measurements and calculations as well as the design of the cross section. Anyone who has watched Norm on the television show New Yankee Workshop will know the phrase: "Before we use any power tools, let's take a moment to talk about shop safety. Be sure to read, understand, and follow all the safety rules that come with your power tools. Knowing how to use your power tools properly will greatly reduce the risk of personal injury. And remember this: there is no more important safety rule than to wear these — safety glasses." 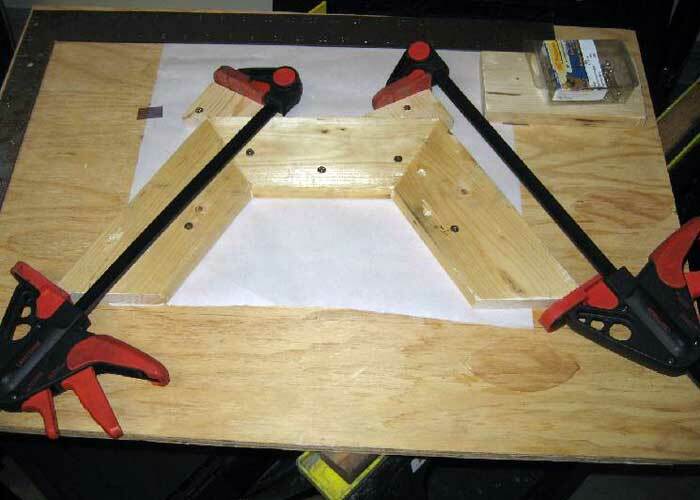 With the basic design established, I was ready to test the legitimacy of the design by making a prototype from scrap wood before buying any quality lumber. I had some suitable scrap pine that was 3-1/2 inches wide and just under 5/8 thick. Using some basic geometry I determined that I was going to have to cut the board into trapezoid shapes with a 30 degree angle (remember six segments means each wedge is 60 degrees of the 360 circle). The long side of the trapezoid was to be 9-1/4 inches. This allowed a little scrap to be cut-off on the outer diameter. I was too lazy to make a complete wheel for the prototype, so I made only a partial wheel. The design called for me to fabricate the wheel in two halves (think about the two halves of a bagel after you slice it). For my prototype, I made half of one of the halves. I glued up the three segments in a homemade jig. I used Gorilla Glue since it is very strong, totally water proof, and is stainable should there be any glue visible in the joints. Gorilla Glue is a particular brand of glue sold in North America; it's urethane type glue that is suitable for bonding different materials to one another: wood, metal, stone, etc. During the test phase, I also determined what cuts I would be making with the router. There are three basic cuts: 1) the groove in which the outer steel rim will be glued, 2) the outer diameter (OD), and 3) the inner diameter (ID). Once the inner and outer diameters are complete, the router is also used to round-over the edges thus completing the circular cross section of the wheel. 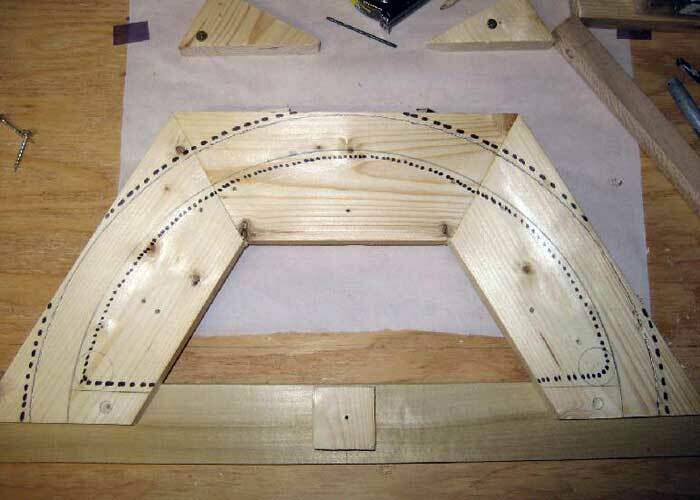 The following four pictures show the glue-up of the three segment test piece (Figure 5); layout of the diameters and rough cut areas (Figure 6); the test piece with machined groove, ID, and OD (Figure 7); and finally the test piece after round-over of the edges (Figure 8). 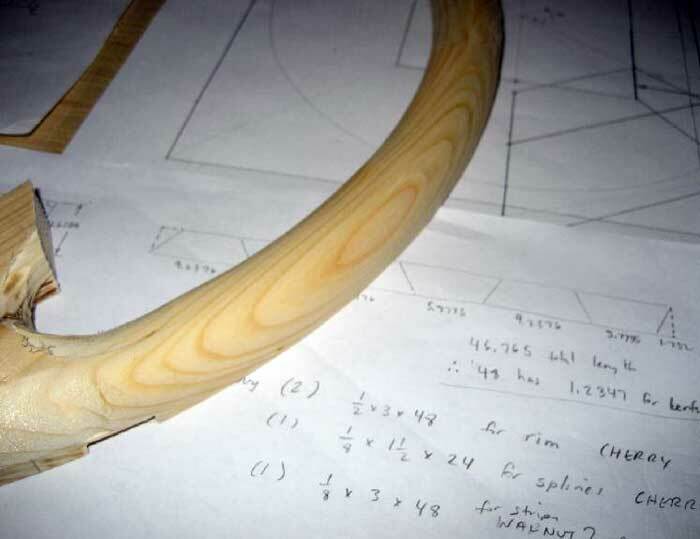 Comments on "DIY Wood Steering Wheel: Part 1 Introduction, Design & Prototype"